Our brain is very power tool. It is trained to process the half information to create the full picture. However such trained brain can be fooled easily. This we can see in the following "Square-Optical Illusion". 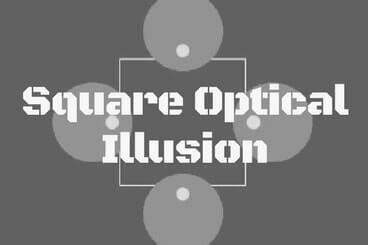 In this optical illusion, as the small circles intersect with the large ones, we seem to see the outlines of a growing and shrinking square. But there is no "square". Our brain is trying to visualize in terms of solid shapes, and fills in the blanks :). 1. Mind Blowing Optical Illusion of Spinning Lady: This Optical Illusion will blow your mind. In this optical illusion a dancing lady is spinning. Now you brain will trick your eyes and you will see it sometimes moving clockwise director and sometimes moving in anti-clockwise direction depending upon whether your left brain or right brain is active. 2. Funny Brain Teaser to Count number of People in Picture: Do you know counting? If the answer is yes, try counting the number of people in this optical illusion. After sometime this picture will rearrange itself and then you will see one person appearing/disappearing in the picture. 3. How to see a hidden picture in Stereogram? : Do you know what is Stereogram picture? It is 3 dimensional picture hidden inside a simple looking drawing or picture. Do checkout this page to know more about Stereogram picture and learn how you can see these hidden pictures. 4. Stroop Effect-Can you pass this color test? : This is very interesting visual test. In this test you have to just say the color of the word which you are reading. Seems simple? Try it out to find if you can pass this color test?